Para obtener el documento conteniendo la información en español, oprima aquí. East San Rafael is characterized by densely populated neighborhoods and high parking demands, making parking a daily challenge. 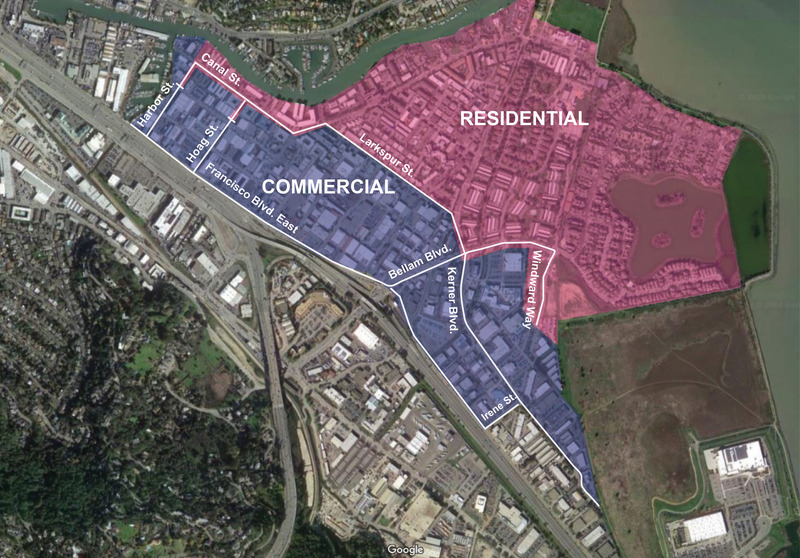 Last year, City Council supported a 6-month study to evaluate existing East San Rafael parking conditions and better prepare parking solutions the City could implement. The study showed parking occupancy rates to be well over 100%, meaning some cars were not parking according to parking regulations. During the study, the City worked closely with residents and businesses compiling feedback and suggestions from surveys and public meetings – including a large public meeting at the Albert J. Boro Community Center – on possible parking solutions. The study identified both short, medium, and long-term solutions – classified based on their time and ease to implement. Based on feedback from the community and studied successful examples in other communities, the City is first pursuing a short-term strategy of implementing time-limited parking. All new parking restrictions will be enforced 7 days a week, including weekends. November 1st – fined citations will be issued after this date. Parking Services, (415) 458-5333, for parking enforcement and a map of the affected blocks. What day will the sign in front of my residence or business be installed? I see the marking for the pole location but do not approve the location, who should I contact? Will I have to move my car for the sign and pole installation? Signs will be installed between July 1, 2018 and September 1, 2018. 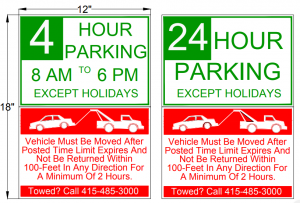 City staff will install the signs in addition to their regular summer duties. They will install the sign when scheduling permits and thus, we cannot provide an exact date or time when your sign will be installed. If you would like to discuss the location of the pole and propose a nearby alternative please make a request online. Pictures of the current location and the preferred location will be helpful but not required. Public Works staff will review your request and reply to let you know whether your request can be accommodated. Please note that while we will do our best to accommodate a request, we may not be able to relocate the sign from the original location. Public Works will work around vehicles. In rare cases that the parking space needs to be used, a sign restricting parking during construction will be placed 72 hours in advanced. Are these rules enforced on holidays? How long will these rules be in effect? Why does the City enforce the new time-limited rules on Sundays? What is the cost of a citation for the 4-hour limit? What is the cost of a citation for the 24-hour limit? How do I find out what the time-limited rules are on my street? How far do I have to move my car to be in compliance with the new rules? May I move my car from one parking space directly to another parking space? What days are the rules enforced? What are the new time-limited rules in East San Rafael (ESR)? No. The 24-hour limit & the 4-hour limit rules are not enforced on holidays. Refer to the list of City holidays here. Time-limited parking will be enforced in ESR for at least one (1) year after commencement. Research has shown that the parking congestion is as prevalent in ESR on Sundays as it is on any other day of the week. Signs will be posted on your street prior to enforcement. Please make sure to familiarize yourself with the time-limits in your area. To be in compliance with the rules, you must move your car at least 100 feet. Also, your car must not return to the original (same) parking space sooner than two (2) hours after it was moved. You may move your car to another parking space at least 100 feet away. You may not return to your original (same) parking space sooner than two (2) hours after it was moved. Time-limited parking will be enforced everyday, 7 days per week, in both commercial & residential areas and except on City Holidays. Vehicles may not be parked in excess of 4 hours in the commercial areas of ESR. The commercial area limit is enforced between 8am – 6pm only.